At the Wicomico Squadron awards banquet in January, Maryland Wing’s Aaron Kleiman received Spaatz Award #1460 from Major General Tony Sarbanes, US Army (ret). In addition to the many squadron members and friends, in attendance were Aarons’ parents; his brother C/Capt Jared Kleiman, MDWG commander Col Larry Trick(Spaatz #452), Vice Commander Lt Col James Steinmemier, Group I Commander Maj Mark Dunker, Director of Cadet Programs Maj Tori Steinmemier (Spaatz #1271) and Director of Aerospace Education Lt Col James Tice. Wicomico Squadron Commander Maj Scott Hawkins served as the evening’s master of ceremonies. 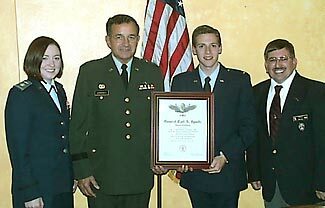 Aaron is now a second lieutenant in the US Air Force, presently attending in pilot training.